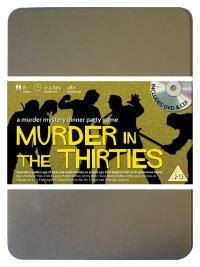 You've been invited to play the role of MANDY SEEVER in Murder in the Thirties. Who shot Sam Shady? Rooseville, 1931. Sam Shady, private eye to the stars, is celebrating his birthday in style. He’s invited all his current clients, as well as his closest rival, to dinner at his classy house. As his guests are getting to know each other before the first course arrives, Sam steps outside for a quiet smoke and shortly afterwards, he is found lying dead in the middle of his lawn. Find out who made Sam’s birthday go with a bang! The femme fatale (she’s always had a lot of front!) Costume : Your red skirt suit is cut provocatively to above the knee (this is the 1930’s!) with a daring low cut blouse showing just enough to get what you want from any of the male guests. Scarlet lipstick completes your look. Vivacious and curvaceous, you are the original “good-time girl”. You have been married to Al DaBone for three years and he certainly lives up to his name. Some people think you’re dumb, just because you’re blonde and you have considerable assets, but you showed them how smart you are when you married the richest man in town!